From 15 July onwards, passengers of 26 Rajdhani and Duronto Express Trains will be able to avail revamped meals from IRCTC. As per the latest report of Financial Express, Indian Railways is going to make changes in the lunch and dinner meals by reducing the number of items in order to rationalize meal costs and to avoid food wastage. Earlier it was reported that these trains could offer aircraft-like combo but now it has been confirmed that full meals will continue to be offered but in a more rationalized way. There are 26 trains under IRCTC catering that will have the revamped meals for which tenders will be awarded maximum by June 25. Some of the major trains in this category include Bandra Terminus-Hazrat Nizamuddin Rajdhani Special, Howrah-New Delhi Rajdhani Express, Ahmedabad-New Delhi Swarna Jayanti Rajdhani Express, Chennai Central-Hazrat Nizamuddin Duronto Express, and Howrah-New Delhi Duronto Express. Before taking this decision, IRCTC contacted an external agency to take a survey for Rajdhani, Shatabdi and Duronto Express trains in which it was found that 79% of passengers prefer regular meals against combo meals. Therefore it was decided that combo meals will not be given to passengers of Rajdhani and Duronto trains. 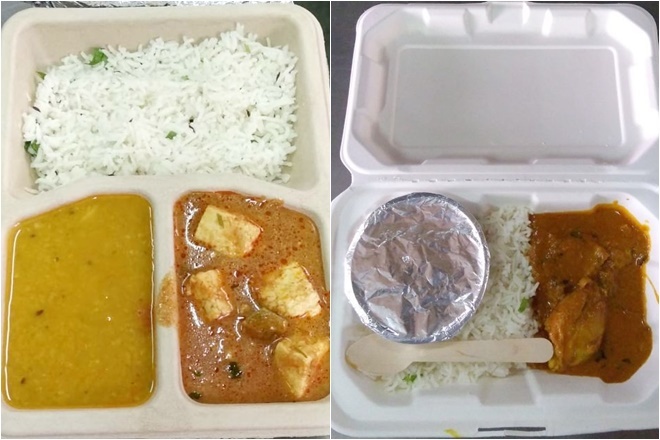 Also, in order to make people enjoy their meals, paneer and chicken that was served for both lunch and dinner will now be replaced with Kofta and Egg Curry for lunch. Besides, IRCTC is planning the usage of meal trolleys equipped with sanitizers and announcements will be made to make the passengers seated for 30 minutes while the meal is served.